Kundan Meena Necklace Set is very gorgeous is used specially for weddings. The concepts of Kundan jewelleries are very old and it carries craftsmanship of the Mughal era. 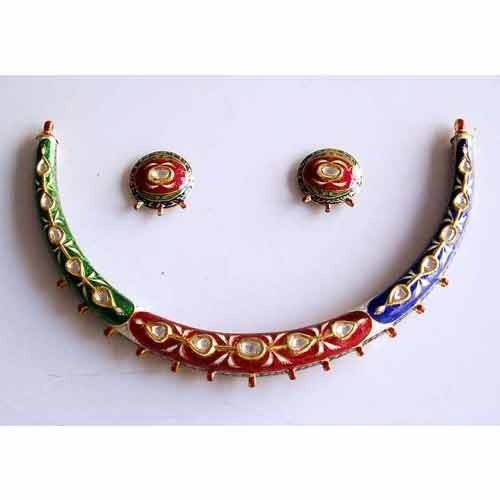 We deal in Kundan Meena necklace sets which includes necklace, pair of earrings and bangles altogether. These are designed for weddings and anniversaries. Usually the designs are heavy and intricate designed along with various types of stone works and studded gemstones. We are manufacturer, exporter and retailer of a wide range of Diamond and Precious Stone Jewellery . Our range of Diamond Jewellery includes Diamond Studded Jewellery, Gold Diamond Jewellery, Silver Diamond jewellery and Color Stone Jewellery. These are manufactured in our advanced manufacturing unit under the guidance of our expert professionals. Our offered ranges of Diamond and Precious Stone Jewellery are strictly checked on various parameters before the final delivery. We keep ourselves updated with the latest trends and industry standards to meet the requirements of the clients. We are looking forward in creating a position of repute in the domestic as well as international market.